Across mainland Europe, it’s safe to say that two bands that have transformed the power metal market in one shape or another have been Sweden’s Sabaton, and the following German act Powerwolf. Between their tongue-in-cheek song titles, religious/historical lyric content, and music that just makes legions headbang, jump, and scream along, it’s little wonder how the band have become headliners beyond their chart-topping achievements. Their seventh album The Sacrament of Sin pushes new elements in terms of instrumentation, new producer, and a ballad for the first time into the mix – proving that the quintet do not wish to remain stagnant when they could easily coast on tried and true principles. But fear not my friends, there are plenty of future anthems that will become a permanent part of their sets for decades (“Fire & Forgive” coming most to mind). Reaching out to the band via Skype after a couple of early summer festival appearances, organist Falk Maria Schlegel seems quite excited to talk about the activities of Powerwolf. You’ll learn more about the differences in The Sacrament of Sin compared to previous discography, where he sees his role as an organ player in the foundation of the band’s sound, plus some discussion of World Cup soccer (football to everyone else outside the USA) and his thoughts on the state of metal today. 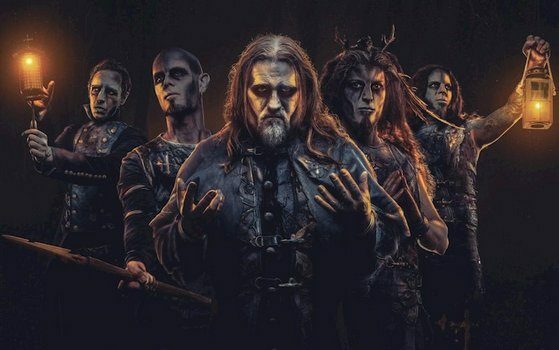 Dead Rhetoric: In your wildest dreams, did you ever imagine Powerwolf becoming the huge success that it has from the start of the band until now? Falk Maria Schlegel: To be honest, no. On the other side though, I had a dream – I saw Iron Maiden for the first time at the Superrock festival in Germany in 1992, Nicko McBrain was taking a picture from the crowd in the audience. I decided wow- I want to play a stage like Iron Maiden has here in Germany. It’s quite big, I know- it was a dream, but I didn’t expect a lot of things that would fall into place. I’m very happy that it has. Dead Rhetoric: The Sacrament of Sin is the newest Powerwolf album. Where do you see the major differences in this latest effort versus your past discography? Schlegel: I would say it’s just more variety on it than the previous (albums). There is a different sound, we used more elements such as a bagpipe, Theremin in parts. For the first time we worked with Jens Bogren, for the previous six albums we worked with Fredrik Nordström – we changed the whole production team. There are some new influences on this album, it’s very detailed with the new songs. In the end, Jens mixed the album like a Powerwolf album needs to sound, and he combined the elements – the orchestration and organ parts. For the first time we have a proper ballad, but we also have some really heavy songs like “Nightside of Siberia” and “Fire & Forgive”, and there is a lot of variety but it’s also typical Powerwolf. Dead Rhetoric: As you just talked about, you finally recorded the first Powerwolf ballad in the band’s career for “Stossgebet”– were you always worried about incorporating this side to the band? Schlegel: If you write a proper ballad, you need to make sure you have something that fits with the song. Everybody in the band is a fan of ballads by acts like Bon Jovi, Guns ‘n’ Roses, it is quite difficult to write a ballad because it has to be catchy and has to have this atmosphere. Matthew came up with the music, and the lyrics follow along. We dared for the first time to do something like this – it’s quite an emotional topic, it’s about reunion and where you meet someone again. Everything fits with the lyrics, for the first time I played the piano – although I did play the piano on the covers album we did for the bonus edition of Blessed & Possessed, we did the song “Edge of Thorns” by Savatage. We recognized we are able to use other instruments and can make them sound like Powerwolf. The time has come to do a song like this- and of course the song that follows “Nightside of Siberia” is one of the heaviest songs we’ve ever done, and then title track which is also quite fast and heavy. 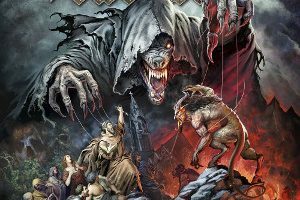 Dead Rhetoric: How did the idea come about for the special edition of the bonus album Communio Luporum, with 10 bands covering Powerwolf classics? Was it a difficult decision to choose what would make the final cut? Schlegel: The idea came up when we were touring last January with Epica. They played “Sacred & Wild” during their soundcheck. Wow- what’s that – I said to the guitar player, that they were playing a song from Powerwolf. They asked if they were allowed, and we said yes- that’s great. And so the idea was born, we had a good aftershow party. We thought it would be a good idea to have more bands cover Powerwolf songs- we asked friends of ours that we liked and bands we respect like Battle Beast, Eluveitie Mille from Kreator, and they all said yes, it is an honor for us. It shows me that this heavy metal family is real, and that you can do something like this. It’s amazing, I’m really proud to be a part of it. Caliban did an old song “Kiss of the Cobra King”, and it was so brilliant and different. I needed a minute to recognize the song- and it shows that a different band is allowed to do things in their own style. I fell in love with “Sacred & Wild” from Epica as well. Dead Rhetoric: Is it a delicate balancing act at this point to create material that satisfies the band, while also making sure you do not stray too far from the established output that your faithful followers love and respect? Schlegel: It’s a struggle to write new stuff. Even if this is the seventh album – there are different time periods in a band’s life and it goes from the songwriting to the recording, the touring into the promotion, and back again. Every time has a certain set of feelings, and it starts with the songwriting like a blank paper that you have to fill it. You don’t know what’s going to happen, you don’t know if you are satisfied yourself with it. It’s always a struggle. On the other hand we are a heavy metal band, and we want to sound like Powerwolf. We don’t want to change too many things, but in musical development you have to change some things. You get new influences into your music, and that’s why for example we choose Jens Bogren to produce us. It was very important for someone from the outside can (give) some influences to the record. I can say you can hear this as a difference to the previous albums. Schlegel: Perfect! The Savatage song is one of my favorites as well. I am a huge fan of Savatage, and of Zak Stevens as well as Jon Oliva as vocalists. There is a lot of discussion between which singer is better, but I think it’s a brilliant song. And this was a difficult song to cover, because we needed that right approach to play it – and it’s quite a different song to how Powerwolf approaches it. Johan is a friend of mine, and it was cool to cover an Amon Amarth track. As you can see with these two songs, that helped us influence some of the tunings for a new song like “Nightside of Siberia” for example, especially in the lower tuning of the guitars. The Metallum Nostrum album was more than just the covers of the bands or a bonus CD- we can use other things and still sound like Powerwolf, and that was quite an eye-opening experience. As I mentioned with Zak Stevens, there are so many great songs with Tony Martin in Black Sabbath- but nobody really remembers them. It was a very creative era for Sabbath, that was chosen by Matthew because he loves the song. Every band member could choose his personal important song- that’s the reason for the songs, especially from a band like Chroming Rose, which is a German heavy metal band. Dead Rhetoric: What would surprise to learn about the business and work ethic that the members of Powerwolf possess? And what do you believe have been some of the keys to your success in this digital age of the music industry? Schlegel: That’s a good question. I would say that you can’t plan success. When we started with Powerwolf we used real world aspects and always wanted to write the best music that we can- and we wanted to deliver (on) both (aspects). At the beginning it was a struggle and quite difficult, as there was more laughing about our makeup and set up – because we are not black metal, we are a power metal band. After a while, we recognized that if you are authentic, if you are really possessed with what you are doing, if you always want to deliver a certain sound- with the church organ sound for example, with the choir things – we recognized that a lot of people love this new kind of music and love our live shows and entertainment. That’s the reason why it’s getting more successful, but as I said you can’t plan success. We do what we want. I’m quite sure what also helps is we are good friends within the band. We’ve only dealt with one lineup change behind the drums – and that was almost eight years ago. Dead Rhetoric: What do you hope audiences get out of Powerwolf when taking in the band at a live show or festival? What would you consider some of the more memorable shows that have taken place – ones that will stay in the memory bank forever? Schlegel: I would say there have been two- a show in Germany and a show in Russia. The whole audience of 3,000 people or more, they fell down on their knees and prayed for our final song “Lupus Dei”. I was playing the organ intro part, and I didn’t recognize something. I watched, and I couldn’t see the audience- and they were on their knees. Attila announced ‘now- everybody stand up and prey!’ and it was really… a huge party then, goosebumps everywhere. Sometimes these types of activities can happen at a huge festival, and if 20,000-30,000 people fall to their knees, grown men start crying while we are performing, it’s an important point. We consider ourselves as entertainers to the audience, but if the audience can also entertain the band, that’s the best combination of both. I’m very happy that we achieve this very often. Dead Rhetoric: The band has always had strong imagery in terms of stage costumes, makeup, and striking visuals with your video work and cover art/merchandise. Can you discuss the importance of imagery when it comes to the overall outlook of Powerwolf? Schlegel: As I mentioned, it’s very important for us, and it’s not always easy to deliver a certain feeling. When we did the “Demon’s Are a Girl’s Best Friend” video, we chose the church, but we chose a different approach to deliver our feelings and show some skin (laughs). In the end, the most important thing is the music- because if you listen to Powerwolf, you don’t see anything, you don’t see stage props. The main approach is to write good sing-a-longs, write heavy metal songs, and the second part is to deliver this on stage with good lights, fire, etc. with an interaction between every band member and the audience. We enjoy it at every show – if we didn’t enjoy it, then it would be our last show. Dead Rhetoric: Following the World Cup proceedings, how disappointing is it to see the former champions Germany not make it past the first round of the tournament? Schlegel: (laughs). To be honest, it’s not so disappointing. We were world champions against Brazil four years ago, we played fantastic. After four years, it doesn’t fit in this same way. It’s better sometimes to recognize that you have to change something on the team. It’s better to have an early end then to play crappy football games. I was so satisfied for the result of the last world championship. It is what it is. It was more difficult for my favorite hometown football team (to lose) two very important games and didn’t end up winning the league. That was very strong for me, because this team was playing so good and then these two mistakes cost them the game. Dead Rhetoric: Your favorite concert of all time is seeing Iron Maiden at SuperRock in 1992. What especially made that show stand out in your mind – and do you have a preference between the Di’Anno, Dickinson, and Blaze Bayley years of the band, or are they all equally special to you? Schlegel: First of all, that was a concert my parents didn’t know about. I was going to the concert with someone else, Black Sabbath was there with Ronnie James Dio, there was Helloween, there was Slayer with Paul Bostaph on the drums. It was only one day, and I can remember that Nicko McBrain did a picture of the audience and that everyone in the audience were throwing cups in the air. 50,000 people throwing stuff in the air like it was raining blood or something. Then “Fear of the Dark” was playing- and I knew I wanted to be on stage someday. As far as your question for Paul Di’Anno, Bruce Dickinson, and Blaze Bayley- there were really good songs with Blaze, on the X Factor album for example. In the end, Bruce is Iron Maiden – his stage acting, his voice, his energy – I would say he is the singer of Iron Maiden. Even the first two albums with Paul, I really like them – a deeper voice, I really prefer Bruce Dickinson. Dead Rhetoric: How do you see the state of the metal music industry today? If you had the power to change or improve things, what would you consider changing and why? Schlegel: Also a good question. The thing is, heavy metal music is not mainstream. A lot of people all over the world are addicted to heavy metal music- that’s quite strange. For example, Powerwolf isn’t a band that you would hear on a normal radio station in Germany. We have achieved the number one chart position with our last album. I don’t know why that is, because everybody else thinks that heavy metal is not very popular. It’s quite good that there’s a heavy metal scene, a certain feeling and atmosphere that’s perhaps very good that we are not in the mass media and in the mainstream radio stations. To improve it is difficult- although I recognize that a lot of new bands have been growing up and put new elements in their music, and that’s good to hear. When you go to festivals, there are of course my favorite bands like Iron Maiden, Guns ‘n’ Roses, and there is a new generation of heavy metal bands that is good for the overall health of the heavy metal scene. Dead Rhetoric: You’ll be doing another headlining tour across Europe with Amaranthe and Kissin’ Dynamite in support. How important is it for the band to put together a unique and diverse touring package that will hopefully bring out the strongest crowds? Schlegel: I think it’s very important. It’s not a typical power metal package. I love to have a little bit more differences between the bands, different styles of music. That’s the reason why we chose these two bands as the support bands- because they are younger bands that have a certain freshness in the air. I like this combination, we are looking at the pre-sales in Europe and they are amazing, we even have to make some upgrades to the venues into some bigger venues. It’s good that we have this good package- it is the Night of the Wolves tour, and it should be a good package for the fans and for every band. We want these bands to be able to use their stage setups, the lights. Dead Rhetoric: Will it be difficult to choose a setlist, now that you have seven albums to pick from, even as the headliners? Schlegel: Yes, it’s always a struggle. We will probably play about two hours. For this new album, there are so many live songs that you could play – we have to of course choose something from all the albums. It’s quite a struggle every time. Perhaps we will rehearse more songs so that we can change up the set list a little bit, that could be our approach for in the end having a good set list every night. Dead Rhetoric: Can you discuss the importance of your organ play within Powerwolf? Schlegel: It’s not only a layering sound, the organ with Matt’s guitar play. It creates atmosphere, and also supports the melodies for Attila. Sometimes a church organ really sends shivers down your spine – it can be more aggressive than sometimes what an electric guitar can do. There’s that one side, it gives that feeling to the songs and it is a trademark of Powerwolf. On the live performances, it’s more than playing my organ, it’s interacting with Attila on stage, and animating with the audience – it’s more than only a keyboard. That was always important for Powerwolf. For example in the song “Fire & Forgive” it starts with this intro thing, you can hear the church organ- and then the verse starts, and there is no organ at all. Sometimes it should be like that, because a heavy metal band is guitars, drums, bass, and voice- and that’s it. And then in the middle part the organ comes back in- and you have a different feeling. It’s helpful to have this instrument in the songwriting process. I never expected to play an organ in a heavy metal band, it’s funny – I learned this instrument when I started to listen to heavy metal music, so that’s quite strange. Normally you have to learn guitar or drums. Dead Rhetoric: Is there any possibility that Powerwolf would come to North America to play some shows- even if it’s on a case by case, festival by festival basis? Or is there certain criteria that have to be met for the band to hit these shores? Schlegel: Yes, we have had a lot of discussion about that so far. We have talked with the promoters, and Gunter our booking agent here in Europe. We have to do this, it’s the time to go over there. There is a big interest in Powerwolf in the US, I really would like to do that. The plans are more concrete now than several years ago. Fingers crossed, I hope that we come over to the US very soon. 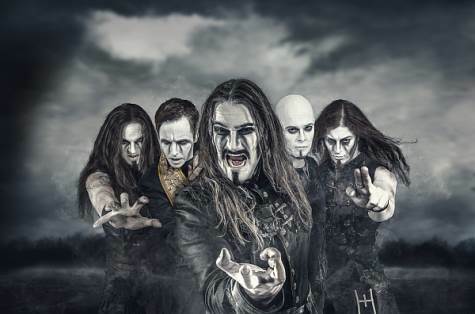 Dead Rhetoric: What are the plans over the next year for Powerwolf? Schlegel: We have already played two festivals, next week we will do some headliner shows and festival appearances. Going after that, in the fall we will do the European tour- we are quite busy, we will have a new stage set up. 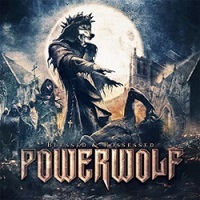 No rest for Powerwolf – always possessed!